In my cub days in journalism I always did my best to avoid covering accidents and fires. To this day when news of earthquakes, fires, hurricanes, and famine are reported I turn the page, change stations or channels or simply apply my mind to something else. If I can’t help I don’t want to know about it. However, as an editor I can’t turn away from human misery. In the case of China’s loss of up to 50,000 on the Richter Scale 8 earthquake, I just couldn’t ignore it. So what I did was search for and found stories about how the tragedy brought out the best in the victims and in those who helped. — 313 words. BEIJING -- Studies suggest optimists live longer and enjoy better health than pessimists. The mystery is why? — 305 words. New York - The 2009 Ford Flex was designed for drivers who want something different, something unique. That's how Richard Gresens describes the type of customers targeted by this all-new crossover, which was introduced to the Canadian auto press earlier this week in the Big Apple. One can scarcely blame religious “nuts” these days if they believe the end is nigh. Biblical writings especially in the Old Testament book of Daniel, a favourite with them, and the Revelations of St. John, the last book in the New Testament present scenarios of end times that resemble our world today. There are wars, pestilence, storms and quakes. We have it all. — 581 words. The confirmed death toll from the disaster had risen to 32,476 by 2:00 pm Sunday, May 18, 2008, and the toll could possibly rise to more than 50,000 as many, still buried in rubble, are feared dead. — 215 words. Driven by a mother's love for her son, and a promise to her husband, a 46-year-old quake victim in Beichuan amputated her own leg and drank her own blood to hold out for 73 hours under rubble before being rescued. Before her ordeal, Gong Tianxiu was known as a faint-hearted person who did not dare sleep alone. — 1,577 words. 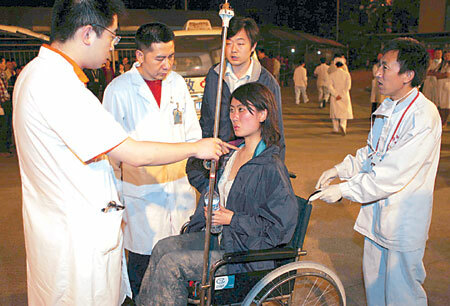 The very first news stories in the aftermath of the quake were about medical personnel who moved patients from trembling buildings to safety. Much of the news came from Chengdu, the provincial capital of Sichuan, which had relatively stable broadcasts from news outlets. 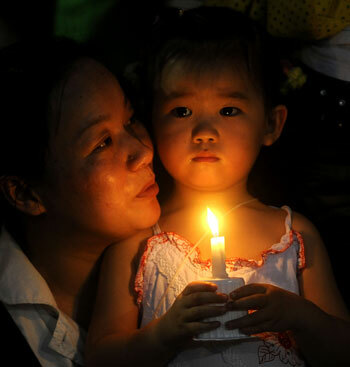 On the evening of Monday, May 12, medical staff in white gowns evacuating from the Chengdu Maternity Hospital were seen on national television. — 1,300 words. Zhu Fumin, a senior high, was respected as a hero for his calmness, courage and wisdom that saved 33 lives. — 595 worlds. The parents of Tang, a 10-year-old primary school student in Chongqing, broke down at the sight of the 20,000 yuan that a Ping An Insurance executive brought for them. — 218 words. China Life Charity Fund will cover all the basic living expenses of children who have lost their parents in the devastating earthquake centered in Sichuan province, until they reach 18 years old, chairman Yang Chao said last night. — 371 words. QINGCHUAN — Foreign rescue teams have joined the front line in the battle to free those trapped after Monday's devastating earthquake in southwest China. — 452 words. Neither the migration of toads, nor unusual cloud formations were clear indicators of an impending earthquake, the country's seismological authority said on Thursday. — 255 words. Kitchenumaykoosib Inninuwug (KI), Ardoch Algonquin, and Asubpeeschoseewagong Netum Anishinabek (Grassy Narrows) First Nations have released a letter directed to the Honourable Steve Peters, Speaker of the House in the Legislative Assembly of Ontario notifying him that the communities and their supporters will conduct traditional ceremonies on the front lawn of the Legislature from May 26 to May 29. — 345 words. CARACAS — Mineral-laden Venezuela on Thursday shut the door to new gold projects and threatened other mining and logging concessions in a step by leftist President Hugo Chavez to tighten control of natural resources. — 417 words. In last week's New York Times, Susan Faludi rejoiced over Hillary Clinton's destruction of the myth of female prissiness and innate moral superiority, hailing Clinton's "no-holds-barred pugnacity" and her media reputation as "nasty" and "ruthless." Future female presidential candidates will owe a lot to the race of 2008, Faludi wrote, "when Hillary Clinton broke through the glass floor and got down with the boys." — 800 words. 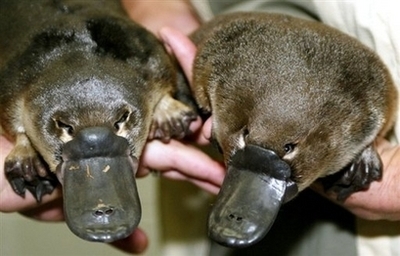 SYDNEY, Australia (China Daily News) — The platypus sports fur like a mammal, paddles its duck feet like a bird and lays eggs in the manner of a reptile. Nature's instruction manual for this oddball, it turns out, is just as much of a mishmash. — 578 words. ‘Through the postwar decades of South Korean right-wing dictatorships, victims' fearful families kept silent about that blood-soaked summer. American military reports of the South Korean slaughter were stamped "secret" and filed away in Washington. Communist accounts were dismissed as lies.’ — 2,208 words. Major New Surge in China! I'm home on this beautiful Florida morning, but my mind is on China. Despite the tragic earthquake, the overall economy is not being negatively impacted. Quite the contrary, a major new growth phase is now underway, and I wanted to give you this brief heads up. — 382 words. One basic idea has been occupying my mind since my old days as a utopian socialist. It came from nowhere, with the simple notions of good and evil inculcated in everybody by the society in which they are born, full of instincts and lacking in values that parents, particularly mothers, begin to sow in any society or epoch. — 1,202 words. Each of the following entrepreneurs provides products for the home. Which one did NOT found a Canadian company? Focus on Real Estate is a new feature in True North Perspective. Each Friday we’ll bring you news and analyses on the subject from throughout the world. Due to logistic reasons it will resume publishing Friday, May 30, 2008. It’s outstanding when a city our size produces such a plethora of fine poets. It’s even more unusual when many of our poets are blessed with perfect pitch and the training & ability to use it. David Angus Mahoney is just such a one who has thrilled audiences throughout The Ottawa Valley with his repetoire of Celtic Bel Canto. David possesses a rare voice that ranges from the baritone to the peaks of the high Irish tenor. —433 words. c) Emmett Culligan, a native of Yankton, South Dakota, founded Culligan International Co., which since 1936 has provided soft water service to homes and businesses. Ablan Leon founded Leon’s furniture in Welland, Ont; Aris Alexanian started Alexanian Carpet and Flooring in Hamilton, Ont. and John Inglis founded a Guelph, Ont. firm that eventually began manufacturing appliances.